Dates are highly nutritious fruits whether you have them fresh or after drying them. Dry dates provide you with abundant energy and have lots of health benefits. They are used in beauty treatments also. Because of the anti-oxidative properties of dry dates, they are very beneficial for fighting against the free radicals that can damage your skin cells and cause premature ageing of the skin. Having dry dates daily will provide you firm and well toned skin, thus preventing ageing of the skin and keeping the skin look young for a long period of time. Vitamin A is essential for keeping our skin healthy. Dry dates are rich sources of Vitamin A and thus provide you healthy and glowing skin by removing dry and dead skin cells and promoting the production of fresh and new skin cells. Dry dates are rich sources of Vitamin B5, which is known as pantothenic acid. This vitamin has the ability to repair cells of the skin that are damaged by the harmful actions of the free radicals formed in the body. So consuming dry dates regularly helps in keeping your skin firm and look naturally beautiful. Consuming dry dates regularly provides you smooth, well nourished and fair skin with a good texture, as it is a satire house of all vital nutrients needed by the skin. Pantothenic acid or Vitamin B5 present in dry dates makes them an excellent food for maintaining a healthy hair. It is considered as a super food for the hair and including this in your regular diet will help in preventing various problems of the hair like split ends, brittle hair, dry hair, hair loss and so on. Hair fall is one of the major problems for most of us. If you are a victim to such a problem, consume dry dates daily. This will help you in preventing hair fall. This is because dry dates are full of nutrients that are essential for healthy growth of the hair and provides all nourishments to the scalp and the roots of the hair. This helps in providing you stronger hair that is healthy and shiny. Dry dates are excellent for keeping the cardiovascular system healthy. They contain very less amount of fat and have no cholesterol. They are also beneficial for lowering the level of LDL or bad cholesterol in the blood. Being low in sodium and high in potassium, dry dates help to keep the blood pressure normal. According to various researches made, dry dates have great antioxidant properties, which help in proper and smoother digestion, thus keeping your stomach clean and healthy. The high amounts of amino acids as well as soluble and insoluble fiber present in dry dates make them beneficial for increasing the secretion of digestive juices by the body and to absorb more nutrients from the food you consume. Various problems connected with improper digestion like acidity, heart burn, colitis and stomach ulcers are also treated by consuming dry dates regularly. Dry dates contain natural sugars like glucose and fructose in high amounts and therefore they are great for increasing your energy. Have them regularly to increase your physical stamina and remain energetic throughout the day. Dry dates contain dietary fiber, which is beneficial for treating constipation. Dry dates keep the colon clear and also play the role of laxatives and ensure proper movement of bowel within the digestive tract. Dry dates greatly help in increasing the strength of your muscles. So, consuming them makes the muscles of the heart stronger and thus provide you a healthier heart. Dry dates are good for pregnant women and they are advised to consume them regularly. This helps in making the muscles of the uterus stronger and thus makes child birth easier. So, have dry dates daily and get strong and healthy muscles. Dry dates are rich sources of vitamins like Vitamin A, C, E, K, B2, B6, niacin, thiamin and so on. These vitamins are essential for keeping your body healthy and disease free. So, you can improve your overall health by consuming dry dates regularly. 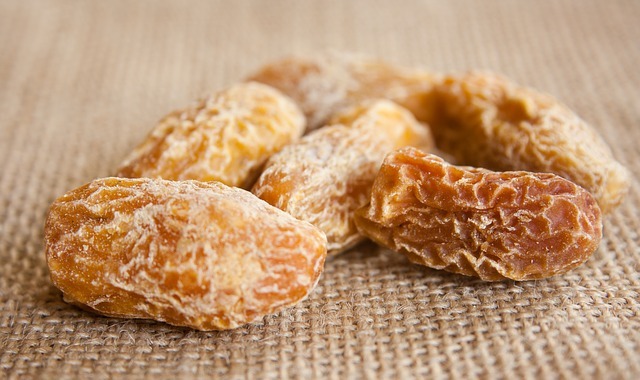 If you are too slim and want to develop your muscles and look healthier, have dry dates. They are full of calories and help in building up your muscles without adding much weight. People engaged in vigorous workouts and sports benefit a lot by consuming dry dates. Iron is one of the most important minerals needed by the body. Dry dates are loaded with iron. This mineral is needed for the formation of red blood corpuscles or haemoglobin in the body and therefore it is essential that you get sufficient quantity of iron daily. Presence of iron in the body ensures normal amount of blood in the body and maintains regular flow of oxygen to different parts of the body. If your body is deficient in iron, you will suffer from anemia. One of the best ways to make sure that you get enough iron is to consume dry dates. Calcium is also found in high quantities in dry dates. This mineral keeps the bones and the teeth strong and healthy. So, consume a handful of dry dates daily and this will keep you away from various bone problems like osteoporosis, osteoarthritis, rheumatoid etc, and from problems of the teeth like tooth decay. All essential minerals like potassium, iron, magnesium, selenium, copper and phosphorous are found in dry dates. These minerals are necessary for the body cells to smoothly carry on their various activities.